I’ve had a few people ask me what drone I have, what kinds of things go a long with it, and how much it all costs. So I decided to put together a quick post that lists everything I’ve got and that I use on a regular basis. These are affiliate links, DJI offers a pretty awesome affiliate program so I thought I would sign up since I already love sharing the drone love! I made a post a while back with some other must have DJI Spark accessories that I love having as well! So first off, the DJI Spark itself. 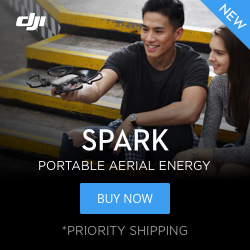 I previously had a Phantom 3, but as soon as the Spark was announced, I sold it and preordered. This thing is just as powerful if not more so than that Phantom, all in a package a tenth of the size! I couldn’t believe how small this was when I first got it. The best part about the size is how easy it is to bring with you. If you are making plans to go fly the drone, it’s probably not as big of a deal. But for someone like me and my family, we make plans to go do other things and I just bring the drone along. Then if the opportunity arises, I break it out and take it for a flight. The size is also amazing when traveling, especially on a plane. I can fit the Spark into my carry on super easy when I would have never considered bringing my Phantom with me. If you can, you should really be getting the DJI Spark with the Fly More Combo. This package comes with two batteries, carry case, extra props, prop guards, and the remote. The remote by itself is worth the extra money as it is required to fly more than the distance the wifi on your phone will reach. The other thing the Fly More combo comes with that I don’t leave home without is extra batteries. I have four right now. At about 15 minutes of flight time a piece, that gives me plenty of time to take enough pictures and videos to play with. I usually take all the footage I wanted to and then typically use the last battery just for flying around. I turn on sport mode and get the drone up to that 30 mph limit. Have I mentioned how fun this drone is to fly? Another accessory that I use all the time is the tablet holder. I have an iPad Mini that I usually use to fly. It’s amazing having the bigger screen to see what your drone is seeing. Plus this way you’re also not killing the batter on your phone if you’re doing an hour of flying. And remember, this all of this stuff is pretty useless if you crash the drone on your first flight. Having the DJI Care Refresh is really important. I don’t leave home without it. There’s no reason to spend this much money and not have it protected.